About - Recycling Services, Inc.
RSI started as a club at Owen J Roberts High School in 1971. Since then, under the leadership of Jim Crater, we have become one of the oldest and most respected recycling and alternative energy resource centers in the Northeast! Recycling Services is a unique place where supporting members bring in their recyclable items and participate in the sorting of their own materials, therefore becoming a part of the recycling process. We are also an alternative energy resource center for those interested in solar, wind and other forms of alternative energy. We have been helping to keep the Pottstown area Green Since 1971! This April 22nd marked the 44th year since a group of students at Owen J. Roberts High School started “The Ecology Club". While recycling had been done in years past, the call for renewed efforts to protect the planet from pollution and save it for future generations deeply touched the heart and mind of one of those students. Jim Crater, now RSI President, has been running a recycling program since then and leading the call for “living lightly on the planet” for most of his life. This past year, Jesse Crater, Jim's son, has stepped up as General Manager of RSI. Jesse has been working at RSI for most of his life and has helped renew interest in using materials locally, especially with a focus on reuse of materials for the arts. 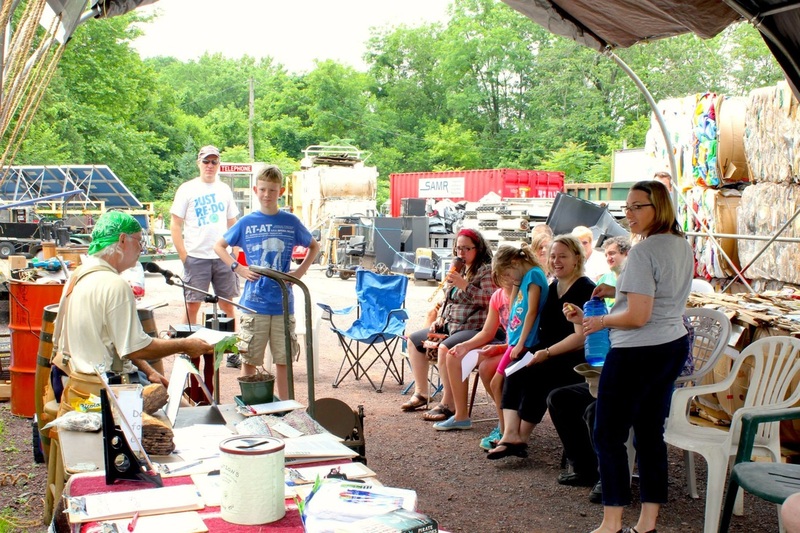 In addition to his work at RSI, Jesse is a community leader and connector in Pottstown and Phoenixville in the arts community. Be sure to meet Jesse if you haven't already, and thank him for his continued efforts in keeping true to Jim's vision. Our collection program now includes over 50 types of glass, metals, papers, plastics, tires, textiles & electronics. In addition to receiving items, RSI is now the destination for increasing numbers of artists and entrepreneurs seeking raw materials such as corks, wine bottles, metal, wax & more.